Are You Looking To Engage With Channel Partners Who Are Highly Invested In Their Companies? What Is Our Marketing Implementation Roadshow? Our Marketing Implementation Roadshow is a 5-city tour focused on bringing in 750 of our clients (MSPs, MSSPs, VARs, solution providers, cloud integrators, etc.) for a 1½-day deep dive on marketing, sales process and business development. What Is The Focus Of The Roadshow? 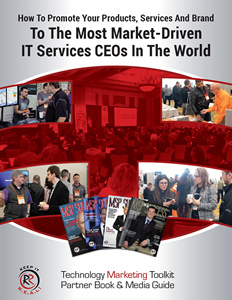 In previous years, we’ve had 750-850 MSPs, MSSPs, VARs and IT services firms register – an average of 160 per show. Because it was so well-received and attended, we’re doing it again…but this time, we’re opening up more sponsorship opportunities since attendees repeatedly told us they LOVED having the sponsors there. Are you tired of dealing with disengaged, unproductive resellers who make zero effort to grow and drive sales, yet constantly complain and do nothing but hang around sucking up precious resources? Would you like to (finally) get in front of more growth-oriented resellers who not only know how to drive sales, but are also easy to work with, appreciative of what you do for them and put their own “skin” in the game? Every person in attendance has paid a considerable amount of their own money to be a client of mine; they will NOT be paid or compensated to attend. They will also be coming to LEARN, not to get a free “paid vacation.” Obviously the people who attend this conference are far more committed and serious about growing their business and becoming a better entrepreneur. We attract C-level decision makers. Because our event is focused on marketing and selling, we naturally attract the business OWNER, not their technical team. They have the budget and the authority to spend it. These resellers are dedicated to learning how to be better business owners, salespeople and marketers. I’m sure you provide a number of tools, training and resources to your resellers – so you should know firsthand that UNLESS the reseller is committed to improving themselves and their business, all the tools and resources in the world (no matter how great they are) will have a zero-sum impact. YOUR goal is to look for partners who are ready and willing to invest in themselves and then match them with the tools and training you have – and that’s why you want to get access to the folks at THIS event. These business owners are HUNGRY for new products and services to sell and bring in new sales; that is why they are coming to the conference in the first place. But unlike those who attend techie conferences that appeal to hobbyists, the audience at my conference takes an aggressive approach to sales and marketing because I’ve personally trained them to think that way. I’ve also given them the tools and coaching they need to actually make it happen. You’ll gain the benefits of a live “Roadshow” for selling your products and services without the costs, logistics, marketing challenges and risk. The people who show up are DRAMATICALLY easier to talk to about your company because they aren’t being distracted by the chaos going on in their office and aren’t hiding behind e-mail, voice mail and gatekeepers. The folks who attend are doers – NOT whiners. I do not tolerate negative attitudes or behaviors from my clients. They know that that type of behavior will result in immediate termination from my program. That’s why the folks you’ll meet at this event are far more pleasant to work with; I’ve already sifted, sorted and screened out the ungrateful whiners and chronic complainers. We are limiting the number of sponsors per event. Plus your booth will be directly in the flow of attendee traffic. That means you won’t be lost in a sea of vendors, fighting for each attendee’s attention. #1. Getting face-to-face with your potential reseller prospects is, without a doubt, the single best way to sell them on being a partner of yours. At these events, you’ll be able to gain access to a large group of BRAND-NEW resellers and deliver a “high-impact” introduction over these two days. You’ll have unfettered access to them at registration and breakfast, at every break, during lunch and after hours. They won’t be hiding behind e-mail and voice mail and will be OUT OF THEIR OFFICE, so you won’t have to compete for their attention. #2. We ENCOURAGE our sponsors to piggyback on our event, essentially having their own mini “roadshow” without all the logistics and costs. To that end, we are very willing to work with you to maximize your ROI by giving you free tickets to invite known prospects in each market area in an effort to get a meeting with them, invite them to breakfast, a lab you’re holding or a special after-hours event. We also allow you to invite (for free) your “raving-fan” clients who can be champions for you to the other people at the event. Just contact us and we’ll work with you on creating the perfect strategy for you. © 2019 Technology Marketing Toolkit, Inc. All rights reserved.